- DC HEDL 1 : a cover illustration for the Egmont album of Lo$, from 1997, by Don Rosa. - IC ZP 148: a cover illustration for "The Sharpie of the Culebra Cut", from 2002, by Marco Rota. 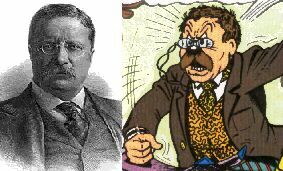 Conservationnist, naturalist, adventurer, author, Theodore "Teddy" Roosevelt, also known as "TR" or "Trust-Buster", was born in 1958, in New York City, into a wealthy family. No doubt it is the fact he had to fight against his poor health (asthma,...) that made him so strong, a model of physical courage and toughness, in what he liked to call the Strenuous Life. 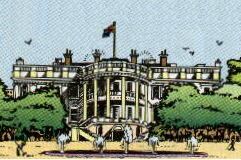 In 1876, Roosevelt entered Harvard University. He graduated on 1880 and married a beautiful young lady, Alice Hathaway Lee, on his 22th birthday. In September, 1883, he spent 10 days in buffalo hunt in Dakota, and entered into partnership of the Maltese Cross ranch. Then, he went back to New York and started becoming a rising progressive star in politics. He became a New York State Assemblyman for three terms. But his ascent was stopped during the presidential election of 1884. Suffering not only because of his political defeat, but also because he lost both his mother and his first wife the same day of 1884, he decided to move to the Dakota Badlands to become a rancher. Roosevelt excelled at this rough and tumble way of life and earned the respect and devotion of the men around him. However, he didn't excel at making money : he lost about half of his entire capital in ranching. But what he gained was, in the long run, of much greater value. In 1886 Roosevelt returned to New York and married a childhood friend : Edith Kermit Carow. With her, he had five children, in addition to the one he had with his first wife. From 1889 to 1895, he was United States Civil Service Commissioner, then, until 1897, he was New York City Police Commissioner, and then, until 1898, he was Assistant Secretary of the Navy. Boss Tom Platt, needing a hero to draw attention away from scandals in New York State, accepted Roosevelt as the Republican candidate for Governor in 1898. Roosevelt won and served with distinction until 1900. After the assassination of President William McKinley in September 1901, at the age of forty-two, Vice President Theodore Roosevelt took the oath of office, becoming the youngest President of the United States before or since. He was a dynamic reformer who especially acted in the fight against trusts. In foreign policy, Roosevelt was very imperialist, especially with central America. Among other things, he made the Panama Canal built. In 1906, he won a Nobel Peace Prize, for having helped fo peace between Japan and Russia. At the end of his term, in 1909, Roosevelt went on an African safari, then jumped back into politics. In 1912 he ran for President on a Progressive ticket, at the same time against Taft and Wilson, who won. He died of an embolism on January 6, 1919, in his house. First, in 1983, in "The Buckaroo of the Badlands" young Scrooge meets young rancher Teddy in the Dakota Badlands. Scrooge helps him while his leg is blocked under a rock which felt on him because his horse was scared by a dinosaure skull. He was hunting a grizzly bear which killed some of his bulls in his ranch. In return for his help, Teddy also helps Scrooge to catch the McViper brothers... He's just called Teddy. In this story, we also meet Murdo McKenzie. Then, after having been separated, their roads cross eachother's again, in 1902, "The Invader of Fort Duckburg" : the Junior Woodchucks, who think that Scrooge is a millionnaire from Scotland who is building a military base where stands Old Fort Duckburg, on Killmotor/Killmule Hill (In fact, he just moved with his two sisters to build his financial empire on Killmotor Hill, in Duckburg, a land he bought to Casey Coot during the gold rush), warn the government. When he learns about that, Roosevelt becomes mad and decides to attack Killmotor Hill, but finally, when he is confronted with the owner of the Fort, after a big battle, he realizes that it's his old friend "Buck" McDuck... So, at night, they have diner together around a fire, and evocate their adventures ( Teddy refers to the Battle of San Santiago)... In this story, it is also said that the Woodchucks fought at Roosevelt's sides in the battle of San Juan Ridge. 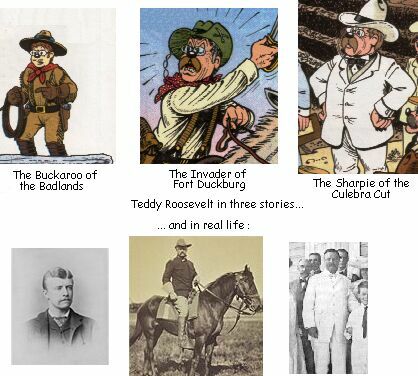 Then, we don't hear anymore about Teddy until 1906, in "The Sharpie of the Culebra Cut" : Scrooge is a trader with the Guaymi Indians, and a gold digger in Panama, and he owns a mountain which is in the axis of the cut, so it bothers Roosevelt. Scrooge finally sells the mountain to Roosevelt, but Scrooge is in a coma when the price has to be told and his sisters choose for him : the first Teddy Bear, made especially for the president and named after him. In this story, we also meet Roosevelt's second wife, Edith, some Rough Riders (Captain George Shanton, and some others), John F. Stevens (the Chief Engineer), Hasting (Teddy's butler), The Guaymi Chief Parita, the General Esteban. In this same story, the names of Philippe Bunau-Varilla, Christopher Columbus, President Amador Guerrero, the Wright brothers, and Sitting Bull are evocated. Then, he also appears in three illustrations for some of the stories he appears in (two by Don Rosa and one by Marco Rota), and also on the hardcover illustration of Egmont's album of "The Lifes and Times of Scrooge McDuck", on a photograph in a scrapbook.